it has been a while since tracking my efforts in the garden. 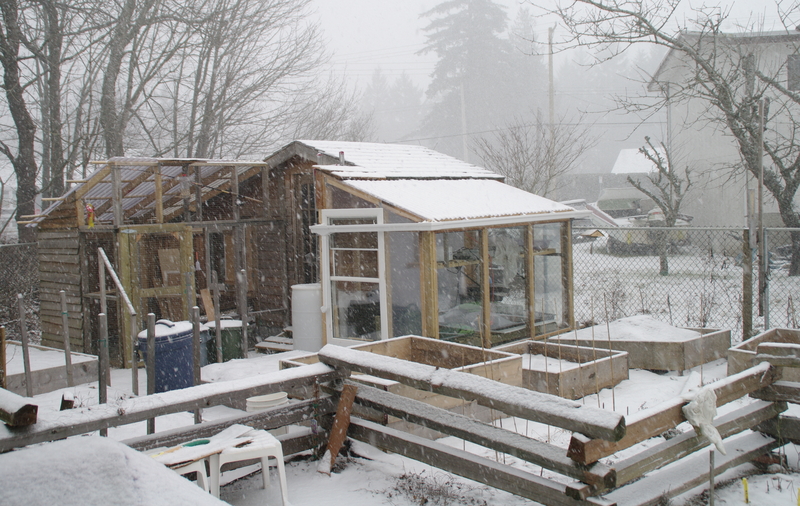 over the course of the winter, i built a lean-to greenhouse against my shed, rearranged the garden layout for more raised veggie beds, and started the design of flower beds and more in the back yard. the greenhouse was the biggest undertaking, particularly with my limited carpentry skills and being useless with a level:). thanks to the always generous neighbours i was able to use double glazed glass in the front and sides with only a couple of small areas covered in plastic. i used clear corrugated pvc for the roof. i’ve recently added two shelving units and put in lighting and a 50 x 120 cm heat pad and a small air heater. only lettuce and radishes are growing for now…kind of cool to see though. on the labour front, the new cedar fence section done, sod lifted and some transplants completed, however, the soil is frozen in spots so have to hold back on most plant moves, including bulbs, herbs and too many columbine.